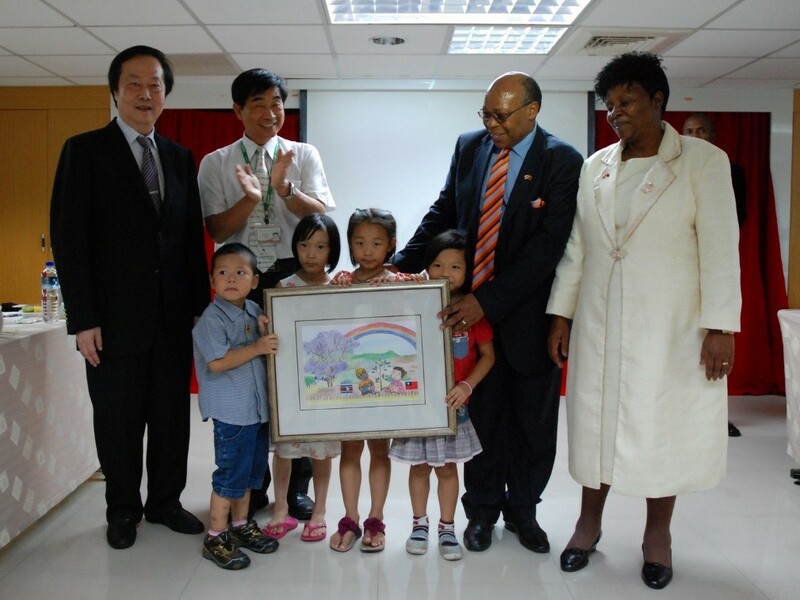 Taiwan-Swaziland relations get more active and solidify friendships through folk diplomacy by charity works. While Taiwan Fund for Children and Families (TFCF) has organized a 26-sponsor delegation to Swaziland to participate TFCF sponsors-sponsored children reunion event, Deputy Prime Minister of the Kingdom of Swaziland Paul Dlamini has led an eight-member delegation to Taiwan to participate in the 104th National Day celebrations of the Republic of China from October 7 to 11, 2015. They also visited TFCF Taichung Headquarters. The kind of coincidences the charitable non-governmental organization and Deputy Prime Minister of the Kingdom of Swaziland visited each others’ country at the same time and the Ministry of Foreign Affairs praised these visits as the best example of folk diplomacy and consolidated the relationship between diplomatic allies. The Kingdom of Swaziland and the Republic of China have been staunch allies since 1968, enjoying frequent mutual visits between senior officials. The Ministry of Foreign Affairs has organized a visit plan for Swaziland delegation, and visited TFCF on October 8 afternoon. The dignataries included Deputy Prime Minister of the Kingdom of Swaziland, Hon. Paul Dlamini, his wife and Swaziland Government officials accompanied by H.E. Ambassador Thamie Dlamini of the Embassy of the Kingdom of Swaziland, and his wife. TFCF Board Member, Mr. Ming-Wen Tsai and CEO, Betty Ho led an 26-sponsor delegation to Swaziland to participate TFCF sponsors-sponsored children reunion program. Together with four children, TFCF Chairman, Mr. Li-Min Chao and Deputy CEO, Mr. Ming-Chuan Chou delivered a picture gift to Deputy Prime Minister Dlamini. The picture of watering plants by two kids signifies friendship and collaboration between Taiwan and Swaziland and join hands and bring greater benefits to disadvantaged children in Swaziland. TFCF Swaziland Branch Office is expecting to collaborate with local government and looks forward to extending TFCF knowledge and professional skills to Swaziland and achieve the mission to improve the community environment of the poor and change the lives of needy children. “It is a great privilege today to have the attendances of the Deputy Prime Minister of Swaziland, Honorable Paul Dlamini, Mrs. Dlamini and other honorable guests. I would like to take this opportunity to welcome you and thank you for visiting our organization.” said Mr. Li-Min Chao, TFCF Chairman. Mr. Chao introduced that Taiwan Fund for Children and Families has been 65 years, and the goal is to help better the lives of the needy children and their families in the world. Now, TFCF is helping more than 67 thousands foreign children in 37 countries. In Swaziland, through the Branch Office, TFCF is capable of expanding services and making a difference in the lives of over 4 thousand and 5 hundred children. He mentioned that TFCF will be going forward and keep on serving the children and families in need continually. Hon. Paul Dlamini expressed that it was a fruitful visit to learn professional experiences about financial assistance for needy families and child protection and see the great achievements of TFCF services. He thanked TFCF specifically who has extended services to Swaziland children and communities and developed more social services and trained the social work as professionals locally. Through a join-effort of INGOs, Swaziland government announced the government’s intention to enforce the Children’s Protection and Welfare Act and contributed to help realize a completely self-sufficient community as an autarky. TFCF CEO, Betty Ho and a 26-sponsor delegation arrived Swaziland on October 8th. There were more than half of sponsors who already met their sponsored children in Mongolia or Kyrgyzstan. “They would like to join the sponsors-sponsored children reunion event again even though it takes a long long journey to reach. Our sponsors would like to see their sponsored children’s livings with their own eyes and encourage the children personally and let them know that there are lots of people caring about their livings and future even sponsors are far away in Taiwan without blood relation.” said Ms. Ho. The Ministry of Foreign Affairs was delighted to see this kind of coincidences the charitable non-governmental organization and Deputy Prime Minister of the Kingdom of Swaziland visited each others’ country at the same time. They praised these visits as the best example of folk diplomacy and strengthened a good friendship between diplomatic allies definitely.